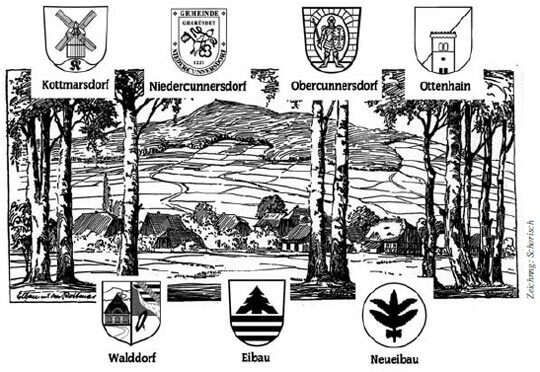 The formerly independent villages of Eibau with the incorporated villages of Walddorf and Neueibau, Obercunnersdorf with the incorporated village of Kottmarsdorf, and Niedercunnersdorf with the incorporated village of Ottenhain, amalgamated on 1 January 2013 to create the new municipality of Kottmar. Geographical centre of our municipality is Kottmar mountain, which stands about 583 metres above sea level. Already from afar, this distinctive landmark guides the way into a region of spectacular scenery with typical half-timbered houses, baroque village churches and countless knolls and mountains. Hiking trails with panoramic lookouts offering splendid views over the beautiful Upper Lusatian landscape are perfect all year round. They attract many hiking fans and invite for great ski tours during the wintertime. Moreover, via the river Spree whose geographically highest spring is located on the western slope of Kottmar mountain, we have a “direct transportation link” to our federal capital of Berlin. Almost all of the seven communities forming the municipality of Kottmar are historically related to the hill of the same name, which, by the way, is both weather and water shed. Half-timbered houses and houses of former traders of linen cloth, both showing numerous elements of rural baroque, are typical for our region and characterise the appearance of the individual communities of our municipality. They bear witness of the tradition of linen weaving and linen cloth trade. With the beginning of industrialisation in the early 19th century, linen cloth traders, i. e. factors, established mechanical weaving mills. Besides agriculture, these weaving mills defined the character of this municipality until the political change in 1989. One benefit amongst others of the merger is that our municipality now offers a great variety of cultural traditions and happenings. 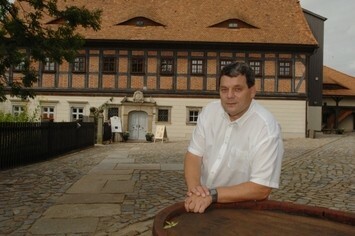 There is not only the annual Eibau beer procession “Eibauer Bierzug” taking place every last Sunday in June. Worthwile visiting are also all the other public festivities and fairs, which contribute to the multifaceted calendar of events and cultural activities taking place throughout the year and proving that Upper Lusatian people very well know how to celebrate and enjoy. Being our guests, you will experience the great diversity of leisure time facilities: You can visit several museums to learn more about life and work of the people of former times or you can exercise in one of our sports facilities or simply enjoy a pleasant stop in a nice restaurant! The staff of our tourist information offices in Eibau (housed in the “Faktorenhof”) and in Obercunnersdorf (housed in the “Haus des Gastes”) will be happy to provide you with desired information and help you planning your stay. We are pleased to welcome you soon as our guests and wish you a pleasant stay in Kottmar!